“Alabama is a better state and the University of Alabama Law School is an infinitely better place due to [Daniel Meador’s] stellar four years of splendid service,” a recent profile in the Alabama Lawyer‘s November 2012 issue concludes. 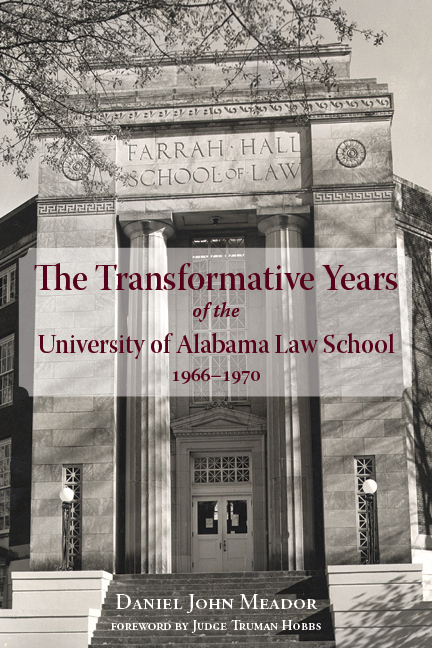 In reviewing Meador’s book The Transformative Years of the University of Alabama Law School: 1966-1970, University of Alabama alumnus Robert Potts’s examines Meador’s tenure at the law school and how Meador contributed to the school’s betterment. Meador describes the high and low points of his work to reform the school in Transformative Years. He successfully raised the law school’s standards, increased the enrollment of African American students, created new fundraising opportunities for the school, and helped the law library be designated as a U.S. Government Depository. Read the full article from Alabama Lawyer. The Transformative Years of the University of Alabama Law School is available from NewSouth Books, Amazon, or your favorite bookstore. You are currently browsing the archives for the Transformative Years category.